There is a lot of love out there for Mary Lambert’s 1989 hit Pet Sematary. Why, again? Was it the wooden lead performances? The adorably sinister villain? Massive Headwound Harry? Come on—there was a lot wrong with that movie and only two things were really right: The Ramones and Zelda. Fear not! Directors Kevin Kölsch and Dennis Widmyer (Starry Eyes) were obviously also affected by Zelda because she (Alyssa Levine) delivers again. On all other items, the directing duo improve. Except The Ramones, but they are here in spirit. Jason Clarke leads things as Louis, big city doc transplanted to quiet, rural Maine. Apparently he and his family—Rachel (Amy Seimetz), Ellie (Jeté Laurence), Gage (Hugo and Lucas Lavoie) and Church the Cat—didn’t ask a lot of questions about that 80-acre lot they bought. Lotta nasty stuff out back. John Lithgow takes over for the tough to replace Fred Gwynne and his over-the-top Mainer accent. Lithgow’s more subdued Grumpy Old Man neighbor falls victim again to the pull of that “sour ground” out back when his beloved little Ellie’s cat gets hit by one of those semis speeding down the nearby road. The film really tests your ability to suspend disbelief, but it also layers a lot of history and creepiness in tidy fashion. The superior performances alone make the reboot a stronger film, although familiarity means it has to try a little harder to actually scare you. One help is a change screenwriters Matt Greenberg and Jeff Buhler make to the story. It’s a big alteration and not everyone will be thrilled, but it limits the laughability once things turn ugly. The film also lessons spiritual guide Pascow’s (Obssa Ahmed) screen time and gives his presence a spookier, less comedic feel. There’s a new ending, too—meaner and more of a gut punch. Nice. 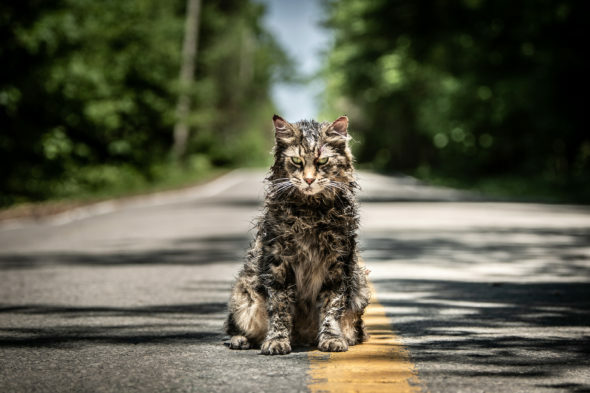 The movie looks good, and Clarke (playing a grieving father for the second time this weekend, after his WWII drama The Aftermath) anchors the events with a thoughtful, believable performance that helps Pet Sematary overcome some of its more nonsensical moments. It is not a classic, but it delivers the goods. I still missed The Ramones.